Tove Djupsjöbacka is a journalist specialised in music (especially music cultures around the world, flamenco and Finnish folk music) and dance, working mostly in Finnish and Swedish. She has been a freelancer for Hufvudstadsbladet, Finland’s biggest Swedish-speaking newspaper, since 1999 and has also worked as editor at Finnish Music Quarterly (2-3/2012), editor (2007-10) and editor-in-chief (1-3/2011) at folk music magazine Pelimanni, editor at the web site Folkmusic.fi (2007-10) as well as editor (2003-05) and editor-in-chief (2005-08) at flamenco magazine Letra. As a freelancer she has had articles published in among others following newspapers and magazines: Finnish Music Quarterly, Teostory, Rondo, Aksentti, Friiti/Trad, Astra Nova, and has also written articles for the Finnish music information centre Fimic. Together with Lena von Bonsdorff she has written the 50 years history of Martin Wegelius -institutet ”Musik i ingenmansland”, published 2006. Tove Djupsjöbacka has had many different kinds of positions in the music field. From 2007 to 2011 she worked at the Finnish Folk Music Association as project secretary. She has been lecturing about especially flamenco and Spanish music as well as Finnish folk music, music cultures of the world and transcription at f.ex. Åbo Akademi, University of Helsinki, University of Tampere, Sibelius-Academy and National Cheng-chi University (Taipei). She was press secretary at the IX international Jean Sibelius vioin competition in 2005 and at the II international Maj Lind piano competition in 2007. From 2003 to 2006 she worked at the press office at Kaustinen Folk Music Festival. Tove Djupsjöbacka is a soprano and has studied singing at Musikinstitutet Kungsvägen 1999-2006 with Rabbe Österholm and Raija Regnell as her teachers. She completed the exam I with excellent notes in 2005. Among her singing experiences the concert Young soloists with Vaasa city orchestra in May 2006 is worth mentioning. She has experience from the stage in among others the children’s opera Pappa Bach (Finnish National Opera 2009), Jaakko Kuusisto: Prinsessan och vildsvanarna (Musikinstitutet Kungsvägen 2003 and 2005), Lars Karlsson: Rödhamn (Finnish National Opera 2002) and Jerome Kern: Teaterbåten (Svenska Teatern 2002-03). Tove Djupsjöbacka is a member of the Sibelius Academy Vocal Ensemble since 2011, Helsinki Chamber Choir (former Radio Chamber Choir) since 2009 and Chamber Choir Utopia since 2004. She has been singing in Akademiska Damkören Lyran 2002-08 (vice conductor 2003-07) and Wegeliuskören 1997-2002. Important conductors have been among others Andrew Lawrence-King, Aapo Häkkinen, Nils Schweckendiek and Kari Turunen. Tove Djupsjöbacka has also studied violin playing, saxophone, percussion and orchestra conducting. She has graduated from Specialiseringslinjen vid Gymnasiet Svenska Normallyceum 1999, specialising in music. Tove Djupsjöbacka is a versatile flamenco expert. She emphasizes the importance of knowing flamenco as a whole as well as communication between dancers and musicians. Knowing the tradition is the base, from there you can reach out to even more radical horizons. She started studying flamenco dance in 1995 and her most important teachers have been Katja Lindroos, Kaari Martin, Katja Lundén, Maija Lepistö and Rafaela Carrasco. Very important influences have come from a lot of artists, among them Belén Maya, Ángel Rojas, Stella Arauzo, Eva Yerbabuena, Israel Galván, Rafael Campallo, Manuel Betanzos, Manuel Liñán, Rocío Molina, Andrés Marín, Manuel Reyes, Isabel Bayón and Andrés Peña. Tove Djupsjöbacka has worked as a dancer in for example Kromosomi 47 Flamenco! (Kari Heiskanen / Katja Lundén / Anja Loikala 2007), Almira (Anna Haaranen 2006), Ganivet, Kirjeitä Satumaasta (Ramón Maronier 2006), Aaltotila (Tove Djupsjöbacka 2005), Camaroneo (Tove Djupsjöbacka and Maija Lepistö 2004), Aquelarre flamenco (Maija Lepistö 2003), La Kalevala (Tove Djupsjöbacka and Kaari Martin 2003), Bernarda Alban talo (Katja Lundén and Kaari Martin 2001). She has done choreographies as mentioned above, and also several solos. From the beginning of her flamenco career Tove Djupsjöbacka has studied both dance and music – cajón, palmas and flamenco singing. She has been performing as a percussionist, palmero, violin player and singer. Important teachers have been Ángel Sánchez ”Cepillo” (cajón), Manuel Soler (cajón), David El Gamba (palmas), Miguel Poveda (singing) and Rafael Jiménez ”Falo” (singing). She has worked as musician in dance pieces like Kuuran kosketus (Marja Rautakorpi and Riina Korhonen 2011), Contrastes (Marianna Verdecia (2006-07) and Jäähyväiset (Anne Riikola and Milla Härmä 2007). Tove Djupsjöbacka has been collaborating with many of the leading flamenco artists in Scandinavia, among them singers Pepita Rohde (Denmark), Thierry Boisdon (Denmark), Taija Tyrväinen (Finland), Anette Åkerlund (Finland), Ulla Mäkilä (Finland), guitarists Poul Knudsen (Denmark), Patrik Bonnet-Jaramillo (Sweden), Raul Mannola (Finland), Ramón Maronier (Holland/Finland), Juho Koskimies (Finland), Chiqui (Spain), Jouni Meriläinen (Finland), Emil Pernblad (Sweden), Robban Svärd (Sweden), percussionists Karo Sampela (Finland/Spain), Ricardo Padilla (Finland), bass player Dile Kolanen (Finland), dancers Maija Lepistö (Finland/Spain), Katja Lundén (Finland), Emilia Aho (Finland), Kaari Martin (Finland), Aylin Bayaz (Finland/Spain), Sari Pikkarainen (Finland) and pipa lute player Chung Yufeng (Taiwan). 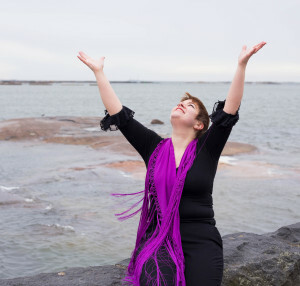 Tove Djupsjöbacka regularly gives intensive courses in flamenco and lectures in different parts of Finland (among others Jyväskylä, Kuopio and Oulu). Among her specialities are courses in flamenco knowledge, bulerias courses and courses combining dance and music (dance + singing + palmas). She has also worked as interpreter and assistant to several Spanish top teachers (Pablo Suáres, David Lagos), been member of the artistic director’s team for the Helsinki Flamenco Festival 2012–2014 and organized the festival Arte flamenco Helsinki in 2015. Error: Error validating access token: Session has expired on Monday, 05-Nov-18 10:58:55 PST. The current time is Monday, 22-Apr-19 05:34:56 PDT.